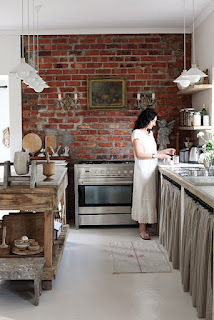 I must admit I've likely logged quite a few hours just surfing the internet looking for kitchen inspiration. And it's interesting how my tastes have changed. 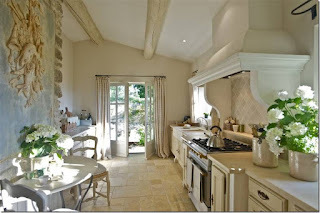 First, my preferences leaned toward an old-world Provence farmhouse style kitchen like the one shown above. 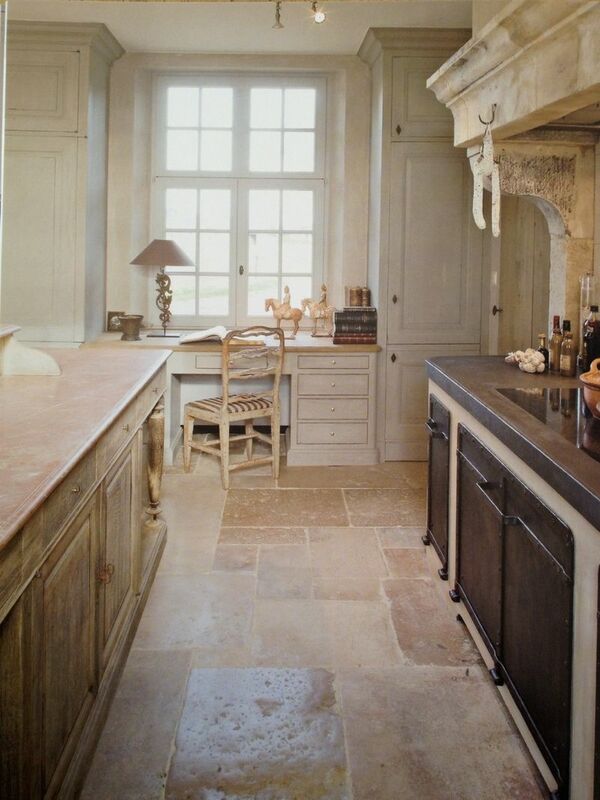 I liked the stone range hood and the light cabinetry. I do love the vaulted ceiling and open beams shown here. Again, there's another big range hood in this kitchen. And traditional lower cabinetry. Although there are no upper cabinets. I do love the floors of this kitchen. The terra cotta pavers look great against the white walls and cabinetry. There's yet another big range hood. But then, I started looking at some kitchens with rustic elements, but decidedly cleaner lines. No upper cabinets here, but there are open shelves. And no big range hoods. 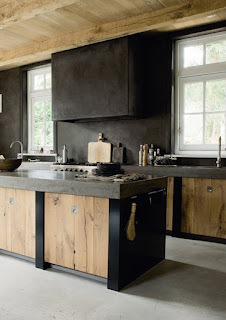 And then I'd find more modern twists on the farmhouse kitchen, such as this one with nice chunky concrete countertops and what looks to be a polished concrete floor. Notice this kitchen has the open-beamed ceiling and no upper cabinetry. 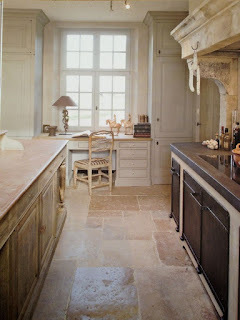 Some incredible stone countertops. 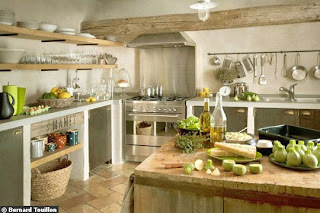 I love how the modern-ness of the stainless steel plays off the rustic stone, wood and even burlap textures. 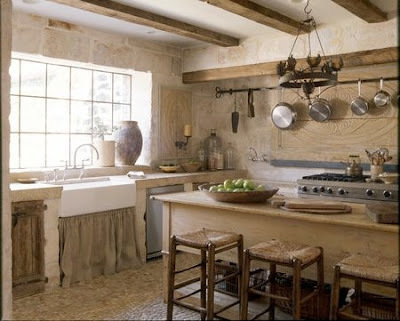 And, I think, this image made me start to dream about putting a skirt below my farmhouse sink. I've got one stored in the garage (thank you, Ikea). More skirted cabinet inspiration. And look at those clean polished concrete floors. How easy to clean. 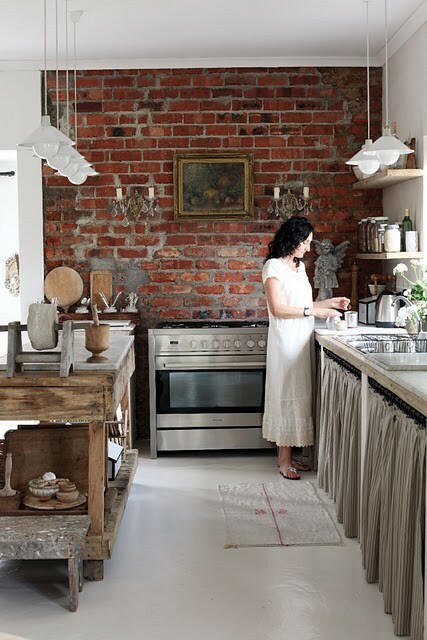 One of the greatest features of this kitchen is how the delicate crystals on those cute sconces on the back wall play off the rustic quality of the brick. The dichotomy of old and modern is what makes this kitchen something special and sooo interesting to look at. 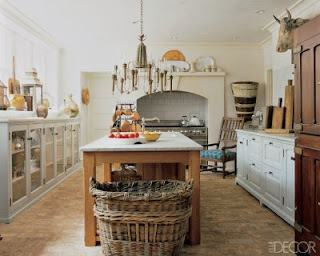 This kitchen is one of my all-time favorites. No upper cabinets. A lot of stainless steel playing off textures of terra cotta and a wood island wrapped with metal. I definitely want to bring in an element akin to that big beam running across the back wall even if it's just decorative, not structural. 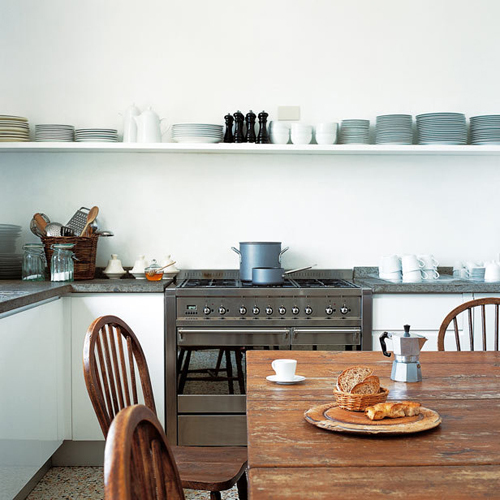 And I'm leaning toward a stainless steel range hood with a stainless steel backsplash as the one shown. It's highly functional (and likely a lot less expensive than a custom stone hood).